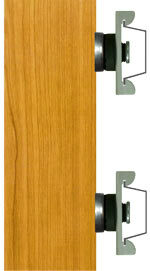 The RSIC-2 RETRO™ Clip is designed for use with various framing designs, and applications. The RSIC-2 RETRO™ Clip will attach to Wood, Metal, Brick, CMU, Concrete, or over existing Gypsum Board. The only change that needs to be made is the type of fastener. The RSIC-2 RETRO™ decouples the Gypsum Board from the framing in wall and floor ceiling assemblies. The RSIC-2 RETRO™ adds 10 to 15 STC pts to your existing assemblies. Reducing the noise transfer by 50 to 75%. The RSIC-2 RETRO™ Clip consists of a RSIC-1 Clip, a 3/8″ cup washer (spacer), and a 2″ steel flat washer to bridge any un-solid substrate such as Gypsum Board. The biggest advantage other than the acoustical improvement is the ability to cover the existing Gypsum Board, reducing labor expenses to tear out the original layer of Gypsum. The RSIC-2 RETRO™ will add a 2″ cavity to your noise control assembly and allow for a 2″ mechanical chase to run any additional water service lines, or electrical wires needed to complete your projects.